Politicians fear her, unions revere her, and the entire state has felt the impact of her actions. 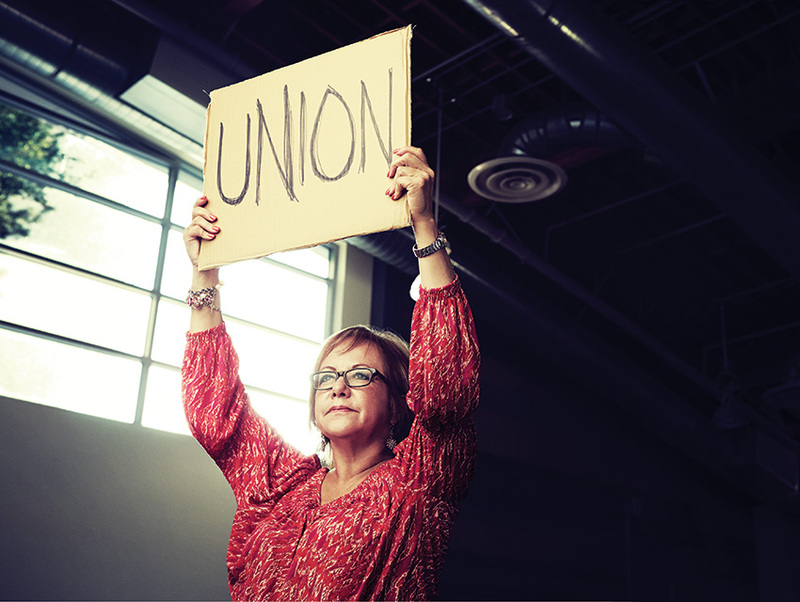 How did labor leader Maria Elena Durazo become so powerful? The sky starts to glow as a cool dawn sets in above Chavez Ravine, where a few hundred labor union activists have assembled for a caravan to Bakersfield—a media event, as it were. Their plan is to bother some Republican congressman about the immigration reform legislation currently stuck in the bowels of Congress. The different unions clump together—Teamsters dressed in black over by the gate; a small cluster of gray-haired members of IATSE, the entertainment union, by the coffee tables; service workers, dressed in regal purple, marching in a ten-yard oval near the news vans, grateful for the B-roll. A priest walks by eating a doughnut. In the center of the massive parking lot stands María Elena Durazo, a little American flag in her hand as she basks in the warmth of a light affixed to Univision’s TV camera. At five feet two, with chin-length auburn hair and tortoiseshell glasses, María Elena is not exactly what you’d expect in a union boss. That is what they call her, María Elena—everyone in the parking lot, the janitors, the cinematographers, the truck drivers, the welders, the teachers. They all know her and come up to her and hug her, and she hugs them back, tells a joke, and laughs—an infectious cackle. She is at once their kind and loving aunt, and El Jefe. Most of the unions in Los Angeles belong to the Los Angeles County Federation of Labor (often called the “County Fed” or just “the Fed”), the central labor council that represents the AFL-CIO in L.A., a sort of umbrella group composed of about 300 locals and 600,000 workers. It does everything any big union does: push for legislation, run expensive political campaigns, and help unionize workers. Locals pay to be a part of the County Fed, and each has a vote in proportion to how many members it has and how much money it puts in per member. For seven years Durazo has been its executive secretary-treasurer, a title that makes her sound more like a midlevel bureaucrat than what she is: the leader of what is perhaps the most robust labor movement in the country and a woman who some say is the most powerful person in Los Angeles. After all, mayors come and go. Durazo, at age 60, has been around for decades and doesn’t appear to be going anywhere. She walks over to where her staff is gathered by a white pickup truck. Its owner, a retired fireman from Alhambra, has set up a sound system for the union heads and politicians to fire up the crowd before the caravan begins. For now it’s blasting Springsteen’s “Glory Days.” An intern hands Durazo a cup of coffee, and someone tells her that a photographer from Rolling Stone is joining the procession. “Wow! Rolling Stone!” she says, and she starts to dance a sort of shimmy. Glory days / Well, they’ll pass you by, glory days / In the wink of a young girl’s eye, glory days / Glory days. The police department was supposed to assign a few officers to shepherd the line of cars through Elysian Park and toward the 5 freeway. But last night it looked as if the LAPD had canceled without explanation. “So I called Chief Beck,” Durazo tells me, grinning. “I said, ‘Chief, we need them to at least just get us to the freeway.’ He said, ‘OK, I’ll see what I can do.’ ” In the end the LAPD will shut down all four lanes so that the caravan, united as one, can safely enter the freeway and begin its journey. Just how much influence does Durazo have in Los Angeles? Anyone who wants to build anything big—a hotel, a skyscraper, a sports stadium, a rail line—must first go through her and the County Fed, providing assurance that the project will create “good union jobs.” In the exceedingly rare instance that a nonunion project does get approved by the labor-friendly city council, it can face protests and even litigation. Developers are said to be frustrated that a single interest group has so much clout, but nobody is willing to speak openly. “I don’t know any developer who would go on record saying anything that would antagonize María,” a consultant told me. Durazo finally sat down with Garcetti months after the new mayor took office, and while she doesn’t have Garcetti’s ear like she had his predecessor’s, her hold on the 15-member city council remains as strong as ever (she helped elect about two-thirds of them). And, judging from the early favorites in the campaigns to replace the termed-out Zev Yaroslavsky and Gloria Molina, unions appear poised to gain control of the county’s governing body, the five-member Board of Supervisors, which for all its opaqueness has up until now remained stubbornly independent of labor’s grip. For many Durazo’s approach is too singularly focused on creating union jobs, to the detriment of any other consideration—say, traffic, walkability, neighborhood character, or business competitiveness. Some argue that her agenda hurts working-class people as a whole. In 2007, she fought against the expansion of Providence hospital in Mission Hills, which employed nonunion nurses, and she’s opposed nonunion supermarkets like Fresh & Easy, even in poor areas considered “food deserts.” Durazo recently tried to prevent Walmart from opening a Neighborhood Market in a Chinatown storefront that had been vacant for decades, in a part of the city decidedly light on supermarkets (the city council couldn’t stop Walmart, though it wasn’t for lack of trying).